"We write regarding the forcefeeding and restraint of Guantanamo Bay detainees currently on hunger strike.1,2 The World Medical Association specifically prohibits forcefeeding in the Declarations of Tokyo and Malta, to which the American Medical Association is a signatory. Edmondson, in a signed affidavit, stated that “the involuntary feeding was authorized through a lawful order of a higher military authority.”4 This defence, which has previously been described as the Nuremberg defence,5 is not defensible in law. In a reply to an earlier draft of this letter, Edmondson said that he was not forcefeeding but “providing nutritional supplementation on a voluntary basis to detainees who wish to protest their confinement by not taking oral nourishment”. We urge the US government to ensure that detainees are assessed by independent physicians and that techniques such as forcefeeding and restraint chairs are abandoned forthwith in accordance with internationally agreed standards. We declare that we have no conflict of interest." 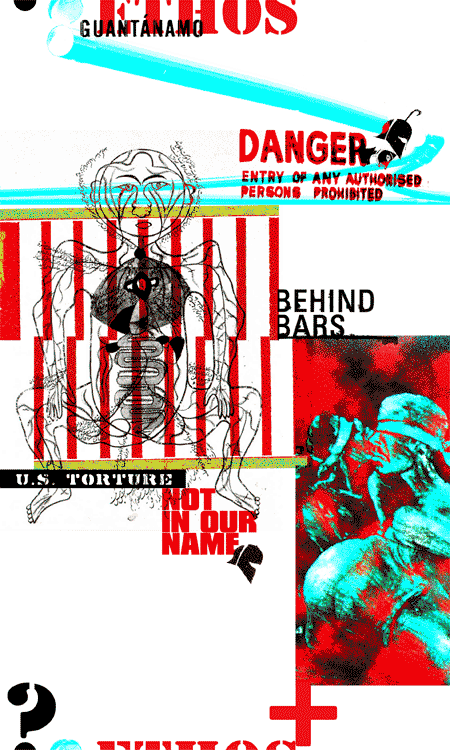 1 Okie S. Glimpses of Guantanamo: medical ethics and the war on terror. N Engl J Med 2005; 353: 2529–34. 2 Golden T. Tough US steps in hunger strike at Camp in Cuba. New York Times Feb 9, 2006 (accessed Feb 22, 2006). 3 Byrington S. Sollock takes command of Naval Hospital. Guantanamo Bay Gazette 2006; 63: 3. (accessed Feb 22,2006). 4 Al Joudi et al vs George Bush in the US District Court for the District of Columbia. Case1: 05-cv-00301-GK. Document 48, Exhibit A. Filed Oct 19, 2005. > guantanamo ethos: the place of living ?